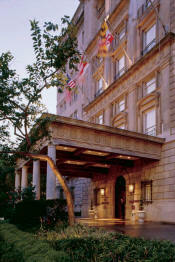 If you are a visitor to the politically-charged state, er, District of Columbia, plan a unique ghost-hunting adventure and stay at one of Washington DC's historic haunted hotels. And if you are a resident of Washington D.C., get to know your state's spookier side and embark on an exploration of the unexplainable and visit one of Washington D.C.'s very own haunted hotels. One of its most haunted hotel is the historic Mayflower Hotel that is home to a ghost who comes for a visit yearly on January 20th. 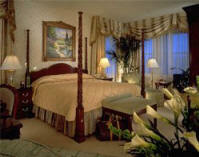 The Hay-Adams Hotel is located in the cosmopolitan city of Washington DC.- home to many a politician. But it is not the ghost of a murdered politician that haunts the Hay-Adams. Surprised? No, this hotel’s resident ghost seems to be the spirit of Clover Adams, the wife of original owner Henry Adams. It is has been reported that the spirit of Mrs. Adams, who committed suicide in 1885, wanders the fourth floor of the hotel. Although she was occasionally depressed and had just lost her father, people whispered that it may have been a murder. She seems a rather sad ghost, and not threatening. Sounds of a woman crying softly in a room or stairwell have been heard, as well as the voice of a woman asking, "what do you want?" in a room when no one else was around. Some housekeepers even report that when alone, they have been called by their name and received a hug while cleaning the rooms! Other unexplained occurrences include the mysterious opening and closing of locked doors and clock radios turning on and off. These incidents happen most frequently during the first two weeks of December - around the anniversary of Clover Adam’s death. 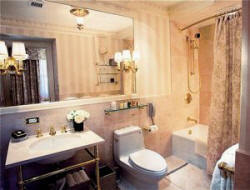 One cool bathroom - we'd stay just for the bathroom! 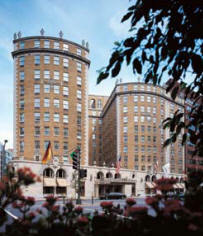 The Historic Renaissance Mayflower Hotel in Washington DC first opened its doors in 1925. The hotel was known as the "Grande Dame of Washington, D.C.," incorporating more inlaid gold than any other building in the country except for the Library of Congress. The Mayflower was also a hotspot of political activity. 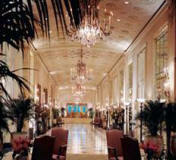 But not only political….there seems to be a ghost that haunts the Renaissance Mayflower Hotel. 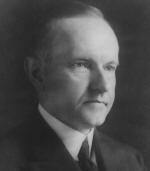 The Mayflower's ghostly history involves the 30th president of the United States, Calvin Coolidge (below) and his inauguration in the year 1925. 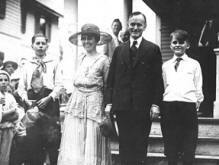 Coolidge went on to win the presidency and was expected to attend the Inaugural Ball at the Mayflower Hotel. However, still in mourning, Coolidge did not attend his own Inaugural Ball. 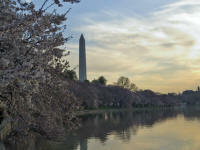 Interestingly, each year on January 20th – the date of Coolidge’s Inaugural Ball, unexplained happenings are reported. At about 10:00pm, the lights dim and flicker – the time that the first guests were announced. Also, an elevator does not move from the eighth floor until 10:15pm – the time when Coolidge would have left his room and come down to the ball. After 10:15pm, the elevator then goes down to the lobby. Could this be Calvin Coolidge’s spirit or that of his son? No one knows for sure. 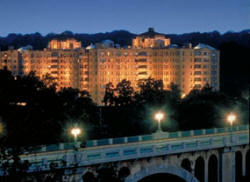 The monolithic Omni Shoreham Hotel has been around since 1930, witnessing much of Washington DC’s political history and figures. Overlooking Rock Creek Park, the 11-acre hotel boasts wide corridors and vaulted ceilings and archways giving it quite an impressive feel. But to haunted hotel enthusiasts, what’s most impressive about the Shoreham is their ghosts. Back when the Shoreham Hotel was a residence hotel, a place where guests can basically live – is when the story begins. It began when a wealthy family moved into Room 864 in 1930. A financial backer of the newly opened Shoreham Hotel, Henry Doherty and his wife lived in a suite on the 8th floor. Living with them in their suite was their adopted daughter, Helen and the suite’s housekeeper/nanny, Juliette Brown. Sometime in 1930, Juliette awoke around 4:00am feeling ill. She reached for the phone, but collapsed and died before she could call for help. Sometime after, the daughter, Helen died mysteriously in the suite. It had been speculated to have been a suicide. But it was hushed up at the time because the family was wealthy. Henry Doherty and his wife soon moved out of that suite. After they moved out, mysterious things began to occur. Televisions and lights would turn on by themselves around 4:00am. If the suite happened to be unoccupied, guests in the adjacent room report to have heard loud noises coming from the suite. Other strange happenings include housekeeping carts moved around on their own, a breeze gently blowing past guests and just an overall eerie presence in the suite. The suite has since been gutted and restored in 2000, but has kept its endearing name, the “Ghost Suite.” But watch out - this three-bedroom suite will cost you $3000 as night! Now that’s more frightening than any ghost!